DiLeo MF, Siu JC, Rhodes MK, López-Villalobos A, Redwine A, Ksiazek K, Dyer RJ. 2014. 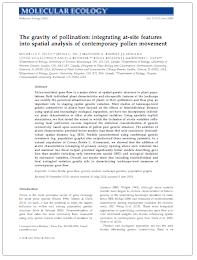 The gravity of pollination: integrating at-site features into spatial analysis of contemporary pollen movement. Molecular Ecology, 23, 2973-2982.